As a kindergarten teacher and chair of the Garden Committee at Coles Elementary School in Manassas, Virginia, I wanted to design a service-learning project that would ignite students’ learning in science, math, and English, while at the same time teaching valuable life lessons. The environmental goal of our school is to explore real-world problems and become a community of environmentally-minded thinkers. When students noticed soil erosion from trees that had been removed for new construction on the school grounds, we brainstormed ways to solve this problem. With the help of a Project Learning Tree GreenWorks! grant, I devised and implemented a school-wide plan of action. 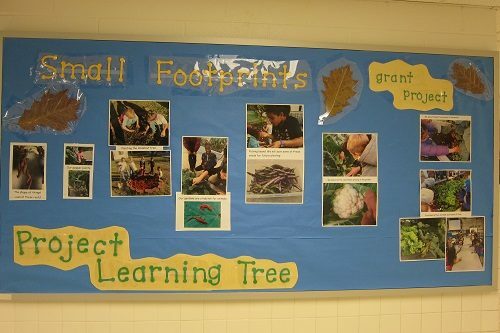 For more than 25 years, Project Learning Tree has been awarding GreenWorks! 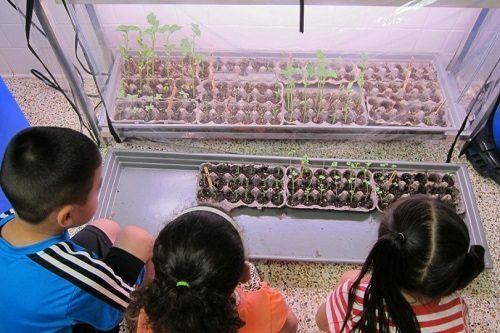 grants to schools and organizations for projects that support children’s learning, ideas, actions, and voices about the environment. The grant given last year to Coles Elementary School sparked science learning across all grade levels as students investigated the value of trees and took action to stop soil erosion on their school grounds. 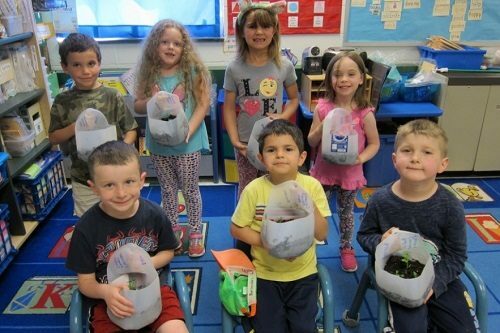 Preschool, kindergarten, and first grade students learned what plants need to grow and the life cycle of plants by growing seedlings and planting them in our school gardens. Throughout the year, they observed patterns in plants and seasonal changes in the garden. They also observed trees and wildlife on the school grounds. PLT activities in the PreK-8 Environmental Education Activity Guide were a huge hit and enhanced student learning. For example, in Activity #1 The Shape of Things, they experienced the many shapes, sizes, textures, and colors found among plants, and in Activity #16 Pass the Plants they gained new knowledge about the parts of plants we eat through a fun snack activity. Second grade students planted hazelnut and chestnut trees. They observed them throughout the seasons and discovered how trees can slow rainwater runoff and reduce soil erosion. They also observed how trees provide food for wildlife. They became good environmental stewards – when a tree was knocked over by wind, they noticed right away and staked it. We used PLT Activity #31 Plant a Tree, to instruct students on how to properly plant a tree. To help students determine where to plant the trees, we used the simulation in Activity #27 Every Tree for Itself. Activity #21 Adopt a Tree, helped students make observations about their trees and document their findings throughout the seasons. T hird, fourth, and fifth grade students took part in all aspects of the service-learning project. They assisted with the planting of 100 native trees on Arbor Day. This was a collaborative effort among students, parents, and the broader community. To keep the project momentum going in the winter, students researched designs for bird nesting boxes and bat houses. They had a creative voice in deciding which designs to build. Through this project, students discovered why birds and bats are important pollinators in Virginia and why shelter is necessary for their survival. To teach students how to get the word out about their projects, we completed the PLT Activity #60 Publicize It! They learned leadership skills and how to present information to the community in a way that would grab attention. To help students learn important concepts about ecosystems, we used Activity #22 Trees as Habitats, Activity #30 Three Cheers for Trees, and Activity #46 School Yard Safari. These activities reinforced the value of trees in reducing soil erosion and providing habitat for wildlife. Establish a garden committee made up of staff members, students, parent volunteers, and local experts. A garden committee is important to help divide the work and involve the community. Leverage the PLT GreenWorks! grant money through community partnerships. We involved our PTA, Arbor Day Foundation, Master Gardeners from Cooperative Extension, 4-H, and other local community groups who provided labor and expert advice. The Arbor Day Foundation donated 50 trees for planting and we obtained reduced prices for materials from local stores. We taught life skills through tree planting and gardening. Students learned responsibility by caring for the plants, learned how to communicate and compromise with each other, gained leadership skills, and developed self confidence. 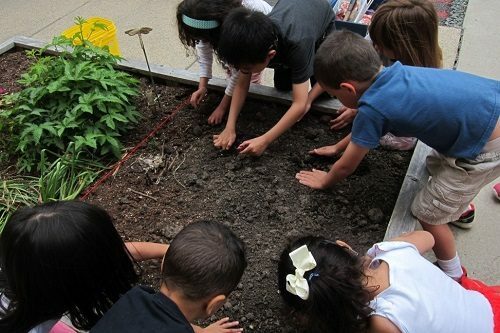 They also developed skills of observation as they watched interactions among plants, animals, soil, and weather. We improved student health by spending time outdoors and providing fresh vegetables for them to eat from the garden. Almost 40 percent of our school population is economically disadvantaged and many of our families contend with food scarcity. 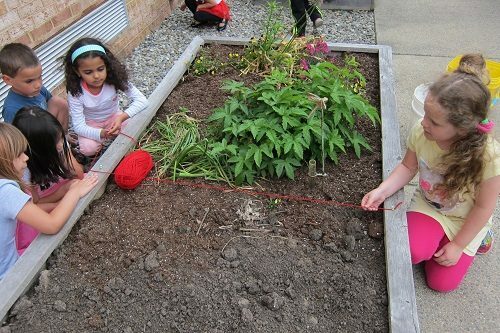 Learning to garden at school and extending that to their home through the container gardens allowed many students to eat fresh vegetables that they planted for the first time. To celebrate our success, we provided tours of our gardens and showed off our various projects on the school grounds. At our spring carnival, participants could select their favorite vegetable seedlings to plant in a container garden to take home. What started out as an effort to stop soil erosion blossomed into a school-wide initiative across all grades and the community! Ramona Richardson is a kindergarten teacher and chair of the Garden Club at Coles Elementary School in Manassas, Virginia. She received the Washington Post’s prestigious Agnes Meyer Outstanding Teacher Award in 2014 for her creativity and contribution to the improvement of education. She was instrumental in creating outdoor classroom space for children of every grade at her school. Her learning gardens have become a model for schools around Prince William County. Strong support for PLT comes from the principal, teachers, and students at this Florida K-8 school. 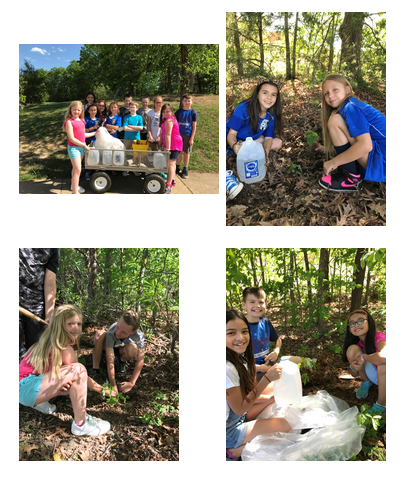 Discovering an endangered Ozark chestnut tree (also called Chinquapin) in the woods near the school campus inspired Acorn School students to take action. Sixteen schools across the country participated in the MonarchLIVE project to build butterfly gardens. Here are the stories of three of those schools. Houston high school students are using PLT to improve health, mentor younger kids, and transform lives.